The cell. 2. Extracellular matrix. Proteins. Atlas of plant and animal histology. The cell. 2. Extracellular matrix. The extracellular matrix of animal tissues is a molecular network mainly composed of proteins, proteoglycans, glycosaminoglycans, and glycoproteins, that comine together to form a diverse set of extracellular matrices. The more abundant structural protein are collagen and elastin. Collagens are a family of proteins found in animals, so abundant that they can be up to 25 to 35 % of the total protein content of the body. Actually, they are the most abundant proteins of the body. Traditionally, collagen has been used to produce glue and adhesives, and that is why the name collagen (from Greek kolla: glue). In vertebrates, there are more than 40 genes for polypeptides known as alpha chains, and three alpha chains join together to form a triple helix, which is the repeated unit used for making macromolecular collagen structures. The combination of different alpha chains makes up to 28 types of collagen. In tissues, the main function of collagen is providing mechanical support and withstand tensile forces, working as the steel bars inside the pillars of buildings. Collagen molecules may be organized in several ways, such as fibers and sheets. Cells bind to collagen molecules through a number of membrane adhesion proteins such as integrins, immunoglobulins, annexins, and some others. Other molecules of the extracellular matrix like proteoglycans and glycoproteins are also able to recognize and bind to collagen molecules. a) A distinct amino acid composition. Glycine is very abundant in the collagen molecule, together with proline and hydroxyproline. Glycine is found every three amino acids in the sequence x-y-Gly-x-y-Gly-x-y-Gly-, where x and y are often proline and hydroxyproline, respectively. Thanks to the low molecular size of the glycine amino acid, this repeated sequence enables polypeptides to adopt left-handed helix conformations, i.e., alpha chains. Figure 1. 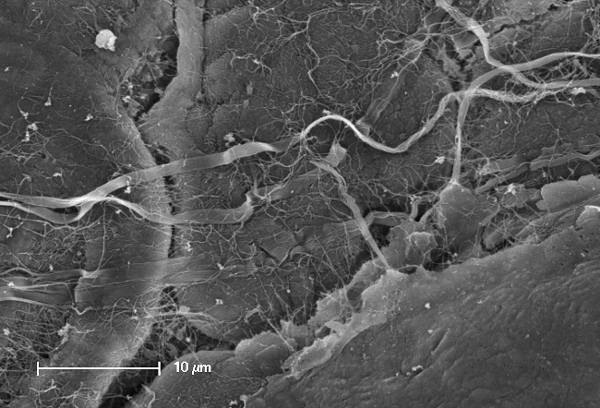 Collagen fibers in the extracellular matrix of the instestine. Scanning electron microscopy. Figure 2. Collagen fibers in the dermis. Masson trichrome staining. Figure 3. 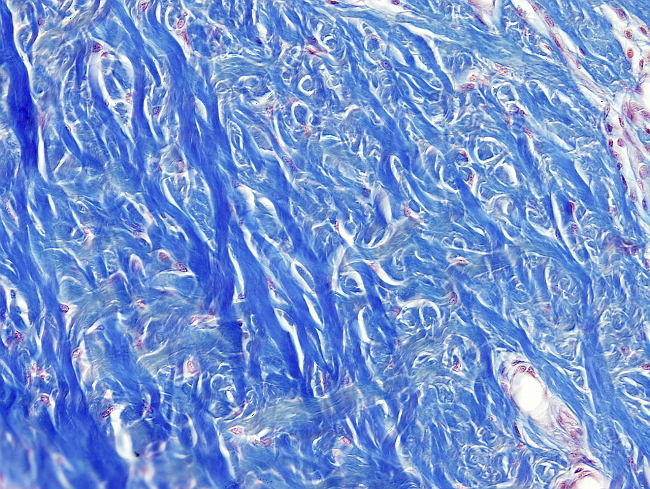 Collagen fibers in the intestinal mucosa. Transmission electron microscopy. b) Collagen can be arranged in fibers, sheets, or it may work as a linking/anchoring molecule. It depends on the amino acid composition of the alpha chains and on the type of alpha chains in the triple helix. The combination of alpha chains may be homotypic (the three alpha chais are the same) or heterotypic (there are different alpha chains). Fibers. Collagen is mostly arranged in fibers made up of aligned and repeated collagen molecules (Figures 1, 2 y 3). 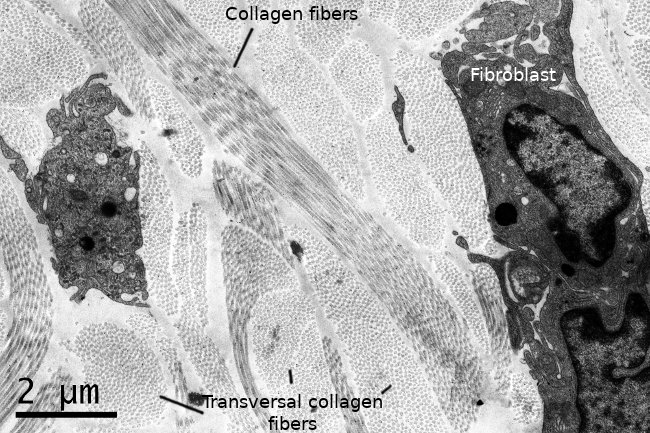 Collagen type I is the most abundant of fibrillar collagens. It is abundant in bones, cartilage and skin, and is up to 90 % of the total collagen content of the body. Other types of fibrillar collagens are type II, mainly located in cartilage, and type III, found in skin and blood vessels. Sheets. There are collagen molecules forming molecular networks arranged in sheets. They are found surrounding organs, in the basal part of epithelial tissues, and around muscle fibers. For example, type IV collagen is a main component of the basal lamina located between epithelia and connective tissue. Cross-linking. 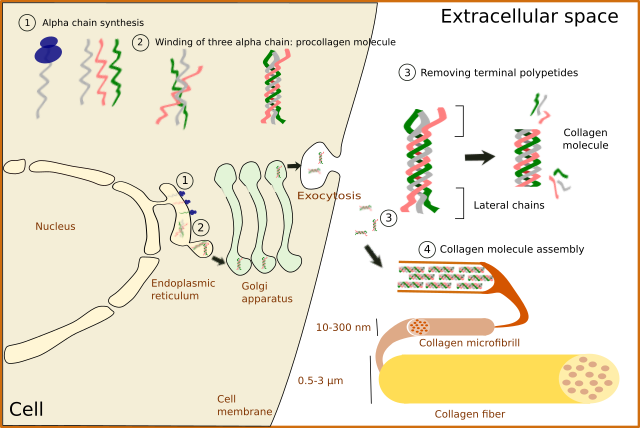 These collagens anchor extracellular molecules to other collagens arranged in either fibrils or sheets. For example, type IX collagen binds both glycosaminoglycans and type II collagen fibers, so that they form a cross-linked set of molecules. Moreover, there are some collagen molecules containing sequences of hydrophobic amino acids inserted in the plasma membrane. For example, type XIII and XVII collagens. Collagen type XVII is part of the molecular structure of hemidesmosomes. No matter the type, collagen is synthesized inside the cell as a precursor: the pro-collagen molecule (Figure 4). First, alpha chains are synthesized in the endoplasmic reticulum, where proline becomes hydroxyproline by hydroxylation. Proline and hydroxyproline may be up to 20 % of the alpha chain. GLycosylation (type O-glycosylation) of alpha chains also occurs in the reticulum. At this point, three alpha chains join together by hydrogen bonds to finally form the pro-collagen molecule. Disulfide bridges are also formed between the alpha chains. Pro-collagen molecules are recognized and linked by transmembrane receptors and packaged in COPII coated vesicles. Typical COPII vesicles are 60 to 90 nm in diameter, but COPII vesicles transporting pro-collagen are 500 nm in diameter because pro-collagen molecules are around 300 nm in length. It is not known how pro-collagen molecules arrive at the Golgi apparatus, cross it, and are released from the TGN to the extracellular space by exocytosis. It is of notice that some cells are able to select different cell membrane domains for releasing different types of collagen. During or after the releasing process, terminal amino acid sequences are enzymatically removed from alpha chains of the pro-collagen molecules so that pro-collagen becomes collagen molecules. These terminal sequences were preventing spontaneous assembling of collagen molecules inside the cell. Figure 4. Steps during collagen synthesis. In fibrillar collagens, collagen molecules are spontaneously assembled into microfibrils that in turn join together to form collagen fibrils (Figures 4 y 5). Types V and XI collagens have been suggested to collaborate during the formation of these collagen fibers, and other molecules like proteoglycans influence the size and organization of these fibers. During the final assembling stage, fibers get stabilized by enzymes like lysyl oxidase. Figure 5. 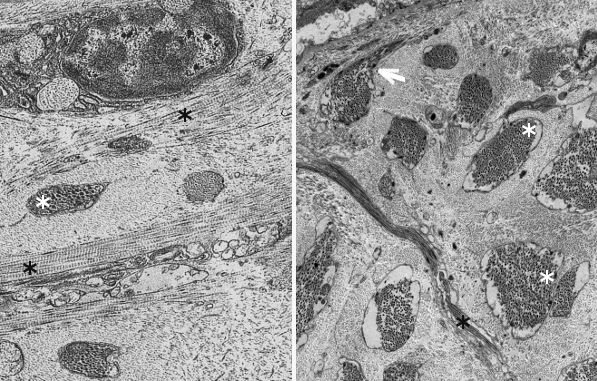 Transmission electron microscopy images of connective tissue of an invertebrate, sea ear gasteropod. Black asterisks indicate assembled collagen fibers in the extracellular space. White asterisks indicate large vesicles filled with pro-collagen molecules. White arrow indicates a likely releasing site for vesicles containing pro-collagen. Collagen is mainly synthesized by fibroblasts, myofibroblasts, osteoblasts and chondrocytes. 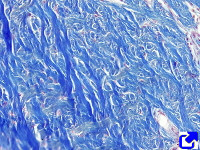 Some collagen types are synthesized by other cells such as epithelial cells. 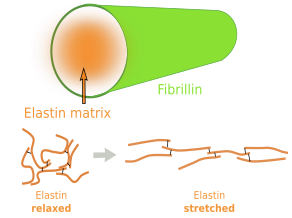 Elastin is an abundant and insoluble polymer made up of proteins that form part of the elastic fibers and (Figure 6) can be found in many extracellular matrices. The major component of elastin is the protein tropoelastin. Tropoeslastin molecules are released into the extracellular matrix and then chemical bonds are formed between each other that hold together large aggregates of proteins. Tropoelastin is a large chain of amino acids with several sequences of hydrophobic amino acids, separated by other sequences containing pairs of glycines and other small amino acids like lysine. This amino acids composition confers the elastic properties: hydrophobic amino acids produce globular structures and lysine allows alpha helix structures. Therefore, in aqueous environments, tropoelastin becomes globular, but it can be stretched by mechanical forces. When forces stop pulling, tropoelastin recovers the globular conformation shrinking the elastic fiber and therefore the tissue. Non hydrophobic amino acids are the binding points for joining together tropoelastin molecules, thus making elastin polymers. The hight content of hydrophobic amino acids makes tropoelastin one of the most tough and durable protein of the extracellular matrix. Tropolastin seems to have been invented by vertebrates, since it has not been found in invertebrates. Figure 7. Parts of an elastic fiber. Lysine amino acid rich regions allow proelastin molecules to be cross-linked. (Modified from Kielty, 2007). Unlike collagen fibers, elastic fibers can be stretched by mechanical forces and after that recover the initial length by shrinking, thanks to the molecular properties of tropoelastin. Elastic fibers are made up elastin (polymer of tropoelastin), which is up to 90 %, and by a coat of fibrillin protein arranged in fibrills, plus other less abundant glycoproteins (Figure 7). The elasticity of our tissues depends greatly on the elastic fibers, which are abundant in the dermis, walls of arteries, and connective tissue of lungs. The amount of elastic fibers is different between tissues. For example, it may be up to 70 % of the extracellular matrix in ligaments. During aging, the proportion of elastic fibers decreases in tissues and organs, and therefore they become stiffer. This is not good for structures like arteries. Besides elasticity, elastic fibers provide support and may regulate cell communication. For example, fibrillin regulates the activity of the transforming growth factor beta (TGF-β). Heino J. 2007. The collagen family members as cell adhesion proteins. Bioessays. 29:1001-1010. Canty EG, Kadler KE. 2005. Procollagen trafficking, processing and fibrillogenesis. Journal of cell sciences. 118:1341-1353. Kadler CM, et al.,. 2007. Collagens at a glance. Journal of cell science. 120:1955-1958. Kielty CM. 2006. Elastic fibres in health and disease. Expert reviews in molecular medicine. 8:1-23.